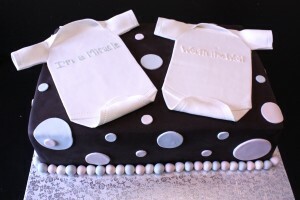 This cake was ordered for a twins baby shower. The mother to be is having a boy and a girl! How exciting! Though you can’t read it well the onesies say “I’m a Miracle” and “Worth the Wait” in pink and blue. The cake was vanilla white cake with vanilla swiss meringue buttercream. This is a Flickr badge showing public photos and videos from TheHappyCake. Make your own badge here.